CHICAGO, May. 22, 2017/MATTER/ -- On Monday, May 22, Karen DeSalvo – former Assistant Secretary for Health and National Coordinator for Health Information Technology – attended the latest meeting of the Health Care Council of Chicago (HC3), an initiative of MATTER and Leavitt Partners. Dr. DeSalvo joined local experts Drs. Art Jones and David Meltzer and they presented some shocking statistics: on average, a person living in certain areas of Chicago’s west side neighborhoods lives 15 fewer years than someone who lives downtown. Other metropolitan areas across the country see similar gaps in health outcomes. These disparities are largely thanks to “social determinants” – the social, environmental, and behavioral factors that account for 60% of the variance in a population’s health. 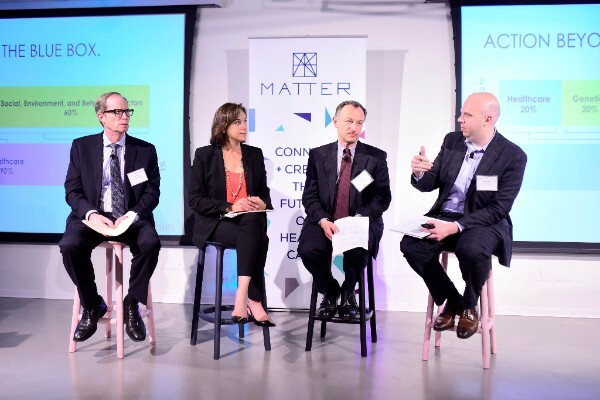 The panel, which was moderated by Leavitt Partners’ David Smith, discussed the effects of social determinants on health and what healthcare leaders can do to improve them. When predicting health outcomes, “Zip code matters more than genetic code,” thanks to social determinants. This is because many population centers do not provide adequate access to healthy food, transportation, education, or childcare. Photos by CloudSpotter; view the full photo gallery from the event here. See our website for more on HC3 or to apply to join the group. The next HC3 event, on Thursday, June 29, will feature experts on value-based care.